Leading bridge and engineering services specialist Mabey is proud to announce that it has shipped twenty-two new bridges to the Ministry of Public Works and Transportation (MoPT) in Costa Rica. The bridges will help the MoPT build its bridging stock in preparation for future natural disasters. Mabey has also supplied a range of bridge spares to enable the MoPT to instantly increase spans and load capacity, and to meet current urgent footbridge requirements. The country’s proximity to the equator means it is prone to intense rain and tropical storms from May through to November, flooding many communities and making accessibility difficult. By having modular bridges ready to deploy, the government can rapidly re-build infrastructure. This is critical to reconnecting communities and ensuring relief workers and supplies can safely reach stricken areas. 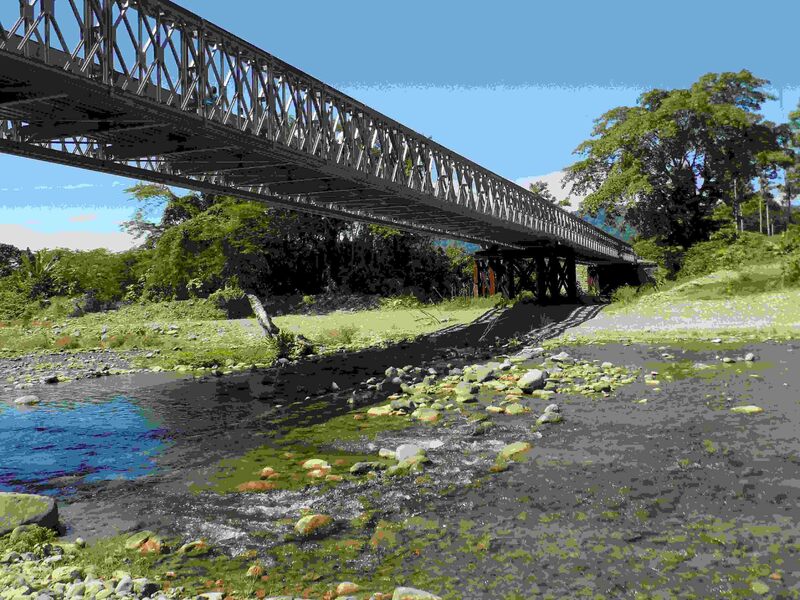 Between 2011 and 2014, Mabey supplied over 70 Compact 200™ (C200™) bridges to Costa Rica as part of a framework agreement with the country’s Ministry of Public Works and Transportation. In a second contract of this type, Mabey was asked to supply 22 additional bridges, after demonstrating that it could deliver the structures within 21 days, allowing the government to respond to any kind of emergency within 45 days. The bridges have been installed in response to many emergency disaster situations, including in the aftermath of Storm Emma, where relief was required not only in remote areas but in the heart of the capital city San José. Mabey has also developed a series of local training courses for the Ministry of Public Works and Transportation to guarantee the successful implementation of each of the bridges. María Ramírez, Director of Bridges at the MOPT, stressed that "Bailey-type modular bridges can be a vital lifeline to restore roads safely and thus help the economy to remain unaffected. The technical training that allows us to develop skills and knowledge locally to install these bridges ourselves is invaluable. Working with Mabey allows us to ensure that we are ready to develop the infrastructure in the short term and minimise isolation due to natural disasters”. In addition to disaster relief, some of the bridges have also been shipped to remote areas to facilitate the access of their inhabitants to basic services, such as the Suruy, an indigenous reservation of the Costa Rican Caribbean. The C200™ bridge is Mabey’s most widely used modular bridge. With a heritage stretching back over 70 years to the original Bailey Bridge, the compact bridge system uses standard, interchangeable steel components to provide robust, rapidly deployed and erected solutions for; permanent bridges, temporary bridges, rural bridges, access bridges, footbridges and emergency and contingency bridging applications.